In Singapore, paper is one of the most common type of waste and about 1.26 million tonnes of paper waste was generated in 2013. We need to eliminate the excessive use of paper and try to reduce paper waste where possible. Cutting down on our use of paper will lead to a smaller environmental impact from paper production, such as less energy and water consumption, less pollution, and less destruction of forests and their biodiversity. Avoid printing emails and web pages unnecessarily. Instead, archive your emails and bookmark your web pages for easy reference. If you need to print web pages often, you can adjust your page and printer settings to minimise the number of pages before printing, for example, reducing the margins for your page or printing 2 pages on a piece of paper. You can also explore the use of software such as GreenPrint to reduce the printing of unwanted pages and images. Have you come across an email signature with a tree logo and the words “Please consider the environment before printing this email”? This is a good way to remind the email recipient to think first before printing. Learn more about this signature and how to add it to your email. Use email instead of fax for sending documents. Just attach the document as a word or pdf file in your email. Or you can scan the document and attach it in your email. If you really need to use the fax, avoid using a cover page. Change the setting of your printer or photocopier to allow double-sided printing or photocopying. If you have unused paper that is printed only on one side, you can also use the manual feed to print and copy on the empty side. By switching to electronic invoicing, your company can reduce paper invoices, envelopes, postage and cut costs. The government has also introduced electronic invoicing, and suppliers billing the ministries, statutory boards and schools are required to submit invoices electronically via the Vendors@Gov portal. Used envelopes in good condition can be reused again for internal mail. Just strike off the old address and write down the new address of the receiving department in your company or organisation. We receive phone bills, bank and credit card statements, and other utilities or government agencies’ statements every month or on a regular basis through the mail. These envelopes, paper bills and statements often end up in the recycling bins or simply thrown away. To prevent the paper waste from being created in the first place, we should aim to reduce the amount of paper used for the bills, statements and envelopes. The best way would be to opt for electronic bills and statements instead of receiving the paper copies through the mail. Check with your current companies and organisations on whether they provide such electronic services. Sign up for those services or feedback to them if they don’t. The printing of ATM receipts not only wasting paper but also creating a litter problem. There are over 1,400 ATM locations provided by the three local banks (DBS/POSB, UOB and OCBC). If there are two people printing receipts from each ATM machine daily, we would end up with more than one million paper receipts annually. And this is not taking into account the fact that there can be more than one ATM machine at each location and that there are other banks with ATM machines. Imagine the paper wasted if we take all these into account. In addition, the receipts are often found as litter around the ATM machines. So choose not to print receipts and check your bank account online or update your bank book regularly to ensure that there is no discrepancy. 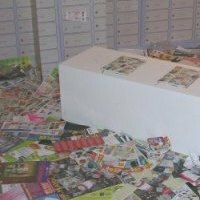 To prevent receiving junk mail through your letterbox, you can use the anti-junk mail catch on your letterbox that shuts the opening. For the unaddressed advertising mail delivered by SingPost, you receive them in your letterbox whether you use the anti-junk mail catch or not. If you wish to stop receiving this advertising mail, SingPost provides an opt-out service for residents who do not wish to receive them. Every year before 15 April, we have to submit our Income Tax return to the Inland Revenue Authority of Singapore (IRAS). You can choose to use e-Filing via internet or phone instead of receiving paper tax forms. This e-Filing service is easy, fast, free and helps to save paper and envelopes. Use a cloth rag or your old clothing for cleaning purposes. It can be reused and helps reduce the need to buy and use disposable paper towels. You can also try using a microfibre cloth instead of using tissue paper or paper towels for cleaning sensitive surfaces such as television, handphone and computer screens, spectacles and mirrors. You can reduce the need to use disposable paper since the cloth can be washed and reused many times. The microfibre cloth also does not scratch the surface and can remove dirt easily, thus reducing the need for water and chemical cleaners. Some newspapers and magazines are available online for reading and there is no need to buy or subscribe to printed copies. The online newspapers and magazines are usually free but some requires a subscription fee. Reading online helps you save paper and money too. I think this site can help with paper bills from organizations? Hi Eugene, if you need any info about GreenPost.com.sg, do contact me. I’ll be happy to answer any questions, and even connect you with the CEO of GreenBills (the company behind GreenPost.com.sg). Hi Eugene and gang, I was clearing my table today and realize i’ve got lots of paper lying around. Finding it a waste to throw the paper away i would always reuse the back of the paper, even by doing that when i’m done with it i still find it a waste to throw it away. You guys know of any organization where they provide recyling bins for paper? @Duke – You can check with the paper collectors at http://app2.nea.gov.sg/topics_collectrade.aspx. Hi,thanks for providing the suggestions regarding to reduce the use of paper at your home or office.Really nice suggestions are provided and definitly i’ll follow these tips also.Thanks again for sharing the information….. I have a question want to ask. If say we saved how many,how many papers, and from the poster of NEA one ton of paper equal to 17 trees. we can calculate we saved how many trees. But do you know one tree every year can absorb how much CO2? rain tree or normal tree, maybe the average? Hi Yan Jun, not sure what’s the exact figure. But I have come across the figure of one tree can absorb 10kg of carbon dioxide a year, can’t remember the source. You can check with NParks. I have been consciously trying to reduces recently, one thing, that I haven’t been able to get to zero is my paper napkins. But I am still limiting the number of napkins I use in a day. Can someone suggest me where can I buy recycled napkins in Singapore. I see some coffee shops provide recycled tissues, but I am unable to find such tissues for personal consumption in any super markets in Singapore. I read somewhere that if you take more than 1/2hour to read your online newspaper the carbon footprint is the same as a newspaper (that is recycled). I have been trying to read online – but am finding it difficult so just wanted to know if this is really true or not? !